When Japan finally emerged from her long Edo period(1603- 1868) of isolation, certain Japanese products - silk dresses, smoking jackets, handkerchiefs, ties, pajamas, stockings, scarves, pottery - were exported. 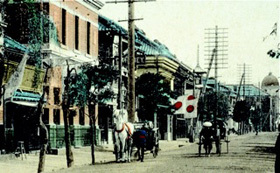 One-hundred-and-fifty years ago, Yokohama led the way with Japanese brands that noblewomen from Europe became fascinated with. This is the story of one man who had knowledge of the West as well as a Japanese spirit - the silk merchant Shiino Shobey - a pioneer whose brand took off against the background of the Meiji Restoration.